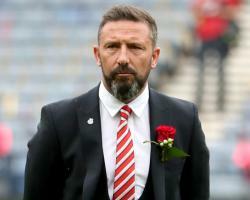 The Black Cats have been targeting McInnes to replace David Moyes, who left in the wake of their relegation to the Championship last season. The statement issued by the Scottish Premier League side read: "The club can confirm that early this afternoon Sunderland FC agreed to meet all the contractual obligations for both Derek McInnes and (assistant) Tony Docherty and they have, reluctantly, been granted permission to speak with both of them about the vacant managerial position at Sunderland. "Aberdeen FC will be making no further comment at this moment in time." McInnes re-emerged as the clear favourite to succeed Moyes after another prospective candidate, Garry Monk, was unveiled by north-east neighbours Middlesbrough in Monday. The 45-year-old led St Johnstone to the Scottish First Division title before taking Aberdeen to second place in the top-flight behind champions Celtic. McInnes still has two years of his contract to run at Pittodrie and Sunderland's willingness to pay the reported Â£1million compensation overcomes a major obstacle to his appointment. But Aberdeen's new major shareholder Dave Cormack has big plans for the club and is known to be desperate to convince his manager to stay. Any deal for McInnes is set to include the appointment of his long-term assistant Docherty, with Moyes' number two Paul Bracewell set to leave the Stadium of Light. The 23-year-old is having a medical ahead of his Â£30million move to Everton.